Despite what my family may otherwise believe, I think that as I have grown older, I have become a little more tolerant. Things that used to drive me mad are now less maddening as I try to put issues into proper perspective. One issue that still drives me up the proverbial wall is unnecessary wastage, particularly of food. Unfortunately I have family, friends and tourists whose eyes are far bigger than their stomachs. Inevitably I need to look away when I see these people fill their plates way more than they should and end up wasting. I tell my children and grandchildren that it is sinful to waste when there are so many people so nearby that are so hungry. Put on your plate what you know you can finish, and, if you are still hungry, with pleasure go and get seconds ! “Bushpigs, unlike many other species have three excellent senses, eyesight, hearing and of course smell. Bushpigs are almost entirely carnivorous and insectivorous – the damage they do to farmland is NOT to get roots, but rather the insects in the ploughed ground, they dig up plants in the process. Our own bushpig will not eat any “crop” stuff, no carrots, potatoes, sweet potatoes etc – she will eat an apple and probably the only crop damage they really do is sweetcorn. Pigs cannot turn their heads to reach their bodies, which is why they rub and scratch using objects – they cannot do as dogs do !! After humans and the great apes, pigs have the largest emotional cortex of any mammal. Bushpigs are very fast, but they have an extra trick because of their low state of gravity, they can be hurtling along flat out and make a 90 degree turn without slipping or skidding. Pigs do not walk on hooves, there is a pad and the hooves are really toenails – pigs can walk on polished floors. When cornered the bushpig raises its crest to the fullest extent – it resembles a porcupine perfectly, this subterfuge may give it enough time to escape when the predator hesitates. 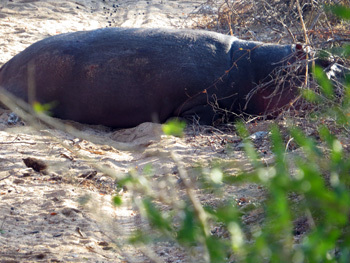 Bushpigs really struggle in daylight, ours comes for breakfast in the mornings, but her eyes cannot take the sunlight. You can get a bushpig to go anywhere and do anything if you offer it fruit yoghurt, although beer will also do the trick. Bushpig shot taken by Camera trap at Tremisana waterhole. We had an early rain at the beginning of the month. It rained the whole day and night and the 27 mm were enough to change the vegetation. After the rain it was difficult to find animals. The vegetation is becoming greener and looking beautiful. During the bushwalk we stopped on top of a hill and watched the sunrise and listened to the birds singing in the morning. The sunrise was so beautiful. I said to my guests it would be more beautiful if a giraffe came between us and the sun, and, believe it or not, before I finished my sentence two giraffes come from nowhere and walked right in front of us ! It was amazing to take photos of giraffe and sunrise. Our tracker, Elvis, picked up some oxpecker calls and detected movement in the bush. He walked little forward to check what was going on. He saw a black rhino standing still behind the bush. Before we approached we checked the wind direction and our escape route. The rhino heard us talking and moved towards us very slowly. It was very close to us in a clear area and the guests were able to take great pictures. It was very cold and raining. Along the way we saw many elephants, impalas, zebra, and two black rhinos browsing very close to the road. After lunch I drove the S100 and our dreams became true : first sighting were five lionesses stalking impala and waterbuck. They tried their best to get one of the impalas but one impala heard a francolin taking off and making lots of noise. All the impalas stopped feeding and looked around to check what was going on and spotted one lioness behind the bush. One impala gave alarm call immediately and all the impalas ran away. A classic sighting of a leopard up a tree was our day’s highlight. This month I have been fortunate to have had some really great sightings. On a bushwalk we were really lucky to find a female black rhino with her calf near the Olifants River. She gave us a minor charge as she spotted us and luckily we were near a safe spot and continued to view her through the bushes until it was safe to leave. On an afternoon game drive, we saw a bull elephant with his askari (a younger bull who he is mentoring and who in later life will assist the older bull). We watched him for a while as he was munching away at some dead branches till he decided to push over a small tree in front of our open vehicle blocking our way. We were forced to turn around. 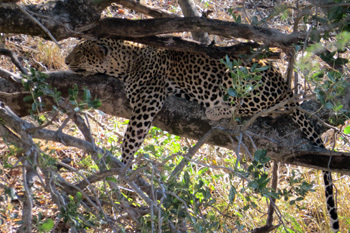 This month hasn’t been very great for me on the leopard sightings but on a game drive through Kruger we were lucky enough to get one in a tree sleeping soundly for the whole day. He literally didn’t move from early in the morning till later that afternoon on our return. 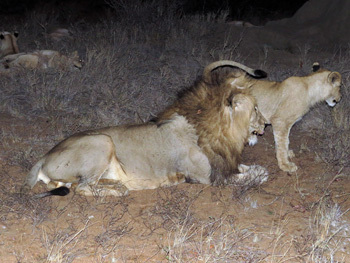 This month the lions have been the stars as on several drives we got some super sightings. On one occasion we got a pride of five right next to the road and two of them decided this was a good time to start mating in front of us. While they were mating, one of my guests stood up to get a photo. The lion started snarling at him and gave us some really great pics. The guest sat down very quickly. We also have been pretty lucky with cheetah sightings – the one day a cheetah made an impala kill just behind Tremisana Lodge near the dam. We stayed with her for about half an hour and watched her eat. On another occasion on the way out of Kruger we got a really great sighting of two young male cheetahs on an impala kill right next to the road. Taking a trip into Kruger gives no promises but provides an adventure like no other. Its mammals, birds, reptiles or simply enjoying the scenery, Kruger provides a destination like no other. I’m often confronted with the task of finding the big five as being a guide you always want to try find all these beautiful creatures, giving your guests an experience they won’t forget. The start of the day often consists of lots of stops, to look at the plains game, a beautiful introduction into the park. I’ve noticed a definite trend with the elephant sightings these are more common in the afternoon. During the morning session the females with the young remain hidden. It’s often just the big bulls who make an appearance. We picked up our first sighting of the Big Five, a big bull elephant, heavily in musth. Musth is the state when elephants have an increased level of testosterone, giving rise to heightened levels of aggression, as well as a strong desire to find females. We snuck past the big fellow, making sure we didn’t challenge him in any way, and headed off to what would be the highlight of the day. It wasn’t long before we were flagged down by an excited looking tourist to the Kruger who told us about a lion sighting. 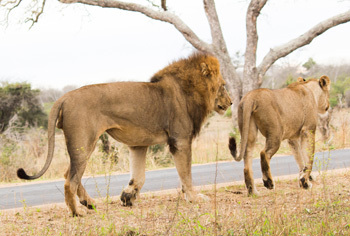 There they were a mating pair of lions lying next to the road, incredibly close to the vehicle. Cameras out and then the action began. The male stood up to move closer to the female, she didn’t look happy to see him. As he drew nearer she reacted with a low assertive growl, showing her teeth. The male didn’t bother asking any more questions, and moved off to the side and found a spot in the shade. Towards the end of this successful day, the setting sun gave the sky a beautiful red colouration. The buffalo sightings had been great all day, the best being a big breeding herd blocking the road in the late afternoon. A big male lion resting in the shade, ample elephants and rhinos resting in the shade, gave us four out of five. All we were missing was the leopard. We drove along through a thick wooded stretch of road, perfect for leopards. The road ahead was blocked by a vehicle parked across the road- , was this going to be the sighting we all wanted ? It sure was – there standing next to the road was a very relaxed male leopard, preparing to cross the road in front of us. It may have been a quick sighting but it certainly was a good one, it gave us a chance to take a picture and then disappeared along its path through the forest. Another great day in the African wilderness. This month was very amazing in terms of good sightings – lovely one of cheetah killing impalas, leopards mating and lots of lions. 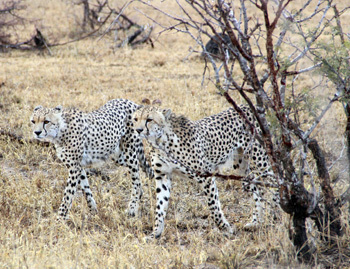 Judging by the number of cheetah sightings this month, you might end up thinking that they are not rare to see. We’ve seen continuously the same two cheetah near Orpen Gate. As it was raining few weeks back most of the day in the park, cats tried by all means to move as close as possible to the tar roads. There were five lions on the H6 sleeping there. Then we found a large breeding herd of buffaloes – a breeding herd of buffaloes is very likely to be followed or associated with lions. We drove to Girivana where we found a big lion trying to stalk warthogs near the water hole. The male didn’t stand any chance because of the open spaces. We then moved on towards the Timbavati River in a search of a leopard. ‎We first had a brilliant sighting of rhinos with a tiny calf. A few metres later we saw two impalas standing very alert and anxiously facing in one direction. As we looked where they were looking, we saw a male leopard sitting very close to the road. Making our way home we got the cheetahs near Orpen feeding on an impala that they had just killed just a metre away from the road – what a day to remember ! On the first of the month I went to Kruger for the full day game drive. A pride of nine lions were lying down on the S36. We then proceeded down road S125 and came across a beautiful Leopard lying in a tree. After lunch we headed north towards Timbavati Picnic spot where we found a very large breeding herd of buffalo in the river bed. Later on we found a cheetah close to the road. My second day in Kruger got us 4 out of 5. At Timbavati a lioness was fighting with a buffalo calf. The fight was spectacular and the lioness took down the young buffalo. We also saw a white rhino followed by a breeding herd of buffalos at the Orpen lookout point. 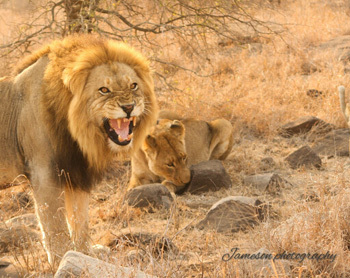 On the 6th, 2 lionesses were reported at the Timbavati River bed. We made our way up there and spent a long time with these lionesses. We watched as they lay down and stood up, moved around and lay down again – typical lion behaviour on a hot day. We continued further and viewed a rhino grazing not more than 20 metres from our open vehicle. Later in the day along the S127 we had a rare and fortunate sighting of two honey badgers crossing the road in front of us. On the 7th, it was a day of cats for us. We came across 2 lionesses just north of Timbavati , then ventured up to Ngotso South Pan to see a male lion who was feeding on a Kudul. In the afternoon, to our surprise we turned down road S127 and found a leopard in a beautiful Leadwood tree. It was a very pleasant day for our guests. On the 13th, we saw 10 lions at S36 about 12kms from Ximangwanini dam. The afternoon turned into a rhino spotting day with 5 rhinos on the S126 and then further up we saw a mother and her calf. On the 21st we had a great sighting of a mating pair of lions on the Timbavati riverbed and then on S100 a male lion lying down about 3 metres from the tar road. This lion was hot and bothered and didn’t move too far out of the shade. We also saw 5 white rhino crossing the road in front of our vehicle. Further down this road we also witnessed a leopard stalking a steenbok. The anticipation and waiting was full of suspense. 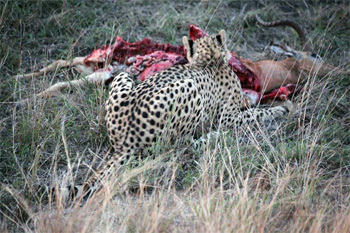 Unfortunately it was not a successful kill – the steenbok detected the leopard and it then ran away. This whole September month has been a good month for me when it comes to sightings – Thank you Mother Nature. On our Sunset drives we have seen a pride of lions on Barnards most of the month. Elephants have been prolific and on our bushwalks we have seen hippo and crocodile out water. 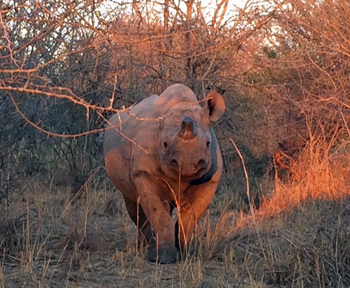 Zulu, the notoriously ill-tempered Black Rhino bull has been charging us most times we encounter him. On one occasion this month, we had 14 guests. We told the guests to go back to vehicle and the rangers stood and watched him. He kept advancing and we kept retreating slowly. He followed us right until we got back into the vehicle. Only when we started the vehicle did he move back. What a character Zulu is ! On another Bushwalk we were charged by an elephant bull. I told the guests to move up to the koppie . In this situation guests need to follow instruction to avoid danger. It is difficult to realise that taking pictures can be dangerous – but anyway we all made it ! One of my best drives ever! I had just started my drive when I discovered some lion tracks right next to the fence and as I got over the hill there they were… 3 lionesses with 6 cubs in the middle of the road! To make it even better they moved towards our car and one cub actually stood next to my car looking at the tyres. Then of course mommy had to take control so she moved in closer, approaching me and my guests by 3m. After such an adrenalin rush experience we finally got to breakfast on the river after looking at some vultures and then a few dagga bull boys (buffalo). Marc’s Treehouse Lodge is going well – we have appointed a previous guide, Vanessa North, to the position of Manager. We wish her well. The rainfall in early September certainly was very welcome – shoots of green grass sprouted within 48 hours of the 22mm downpour and we are certain that many nyala lives were saved. The trees also produced new leaves and our kudus and giraffe are doing very well. With the change in seasons comes the transformation of the bush. The leaves have almost finished falling from the deciduous trees and new foliage is starting to come through, while as you look across the tree line you can see nothing but the beautiful white flowers produced from the Knob Thorn Trees. We have found evidence of Rhinos sleeping and grazing around our camp and some of our guests were fortunate enough to get a great view of a male White Rhino drinking from the riverbed right in front of their treehouse. They said it was one of the most tranquil and surreal moments waking up to the sound of the river and looking out their balcony to see the Rhino in the picture. On the morning of the 4th I was also fortunate enough to be driving into camp and I caught the glimpse of a rhino silhouette behind the bushes. I stopped my car and to my surprise it was a female black rhino. She came out from behind the bushes as she was quite curious and then came a little closer towards my car then quickly ran off back into the bushes. This put a very big smile on my face for the day. The buffalo herds are also starting to make their presence known again, especially to our night security guard who has bumped into them during the night on more than a few occasions on his patrols. The bushwalks in the morning have been a nice way to start the day recently. The weather in the morning is quite refreshing as that winter chill has left us now. The sun is rising earlier and makes for a pleasant way for the guests to enjoy their tea and coffee before we get the walks started. Although we haven’t bumped into the Rhinos and buffalos on foot as yet its only just a matter of time before this will start to happen again, but this doesn’t take away from the daily views of giraffe, nyalas, kudus etc we can get nice and close to. Around the camp we are still continuing to update the reeds around the treehouses and we can now stop pumping water into our breakfast pond, as rains are expected to come over the next few weeks. We are starting to prepare the camp for the summer rains, ensuring the thatching are in good condition and will hold through the heavy downpours the summer will deliver. 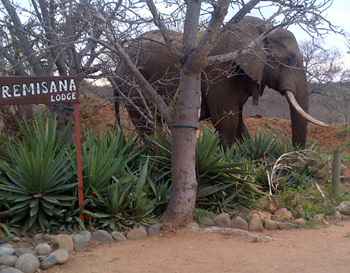 Tremisana Game Lodge has had many animals around as a result of the water at Tremisana Dam. There are both positive and negative consequences of keeping the dam filled with borehole water. Clearly it is great to have numerous animals around the lodge and our tourists have been spoilt. On the negative side, the concentration of animals has depleted the grass supply. In addition the elephants have knocked down more trees this dry season than any season in the previous 20 years. 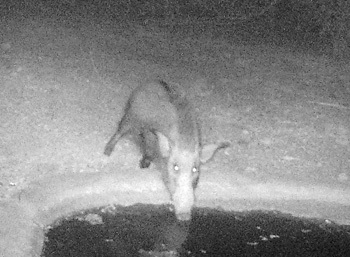 The Trap Camera has recorded great shots of so many animals at the waterhole in front of the Lapa – we have had all the cats and our regular nightly visitors include Bushpig, Civet, Hyena and Porcupine. As the days start warming up drastically, the pool has become a haven for our guests during the day…we often have our newly arrived guests having a quick dip in the pool before leaving for their sunset drive! We have been very busy lately especially during the last days of September. As always our “locals”(Vervet Monkeys) have been learning new skills around the lodge. They have become quite mischievous lately. Occasionally our guests make their way into their rooms and forget to close their doors. What a mess ! Lately we have been noticing a lot of activity around our lodge during the evenings. We have often heard Hyena calling right near our lodge perimeter while our guests are having dinner. We have also had a few more elephants around the lodge just before dinner. I had to arrange a guide to actually go and fetch some of our female staff members that live a little distance from our lodge due to a massive elephant being right nearby their accommodation. We have also had the occasional visit from the elephants to our main entrance area, which had our guests delayed for quite a while. But they seemed pretty happy to wait it out. Went to check one room in afternoon and right behind room I saw a duiker. Our Marula boma has seen quite a lot of activity lately. We have had Hyena calling before or during dinner right next to the vehicles. We also had an occasion whereby a pride of lions had started coming closer to the boma! Luckily our staff had just finished clearing up and were in the vehicle when the lions arrived. The guests were also very safe and already on their way back to the lodge. Our frog choir has become stronger as the days go by. I swear they have found some new members from the nearby ponds! We have been having fun showing our guests these frogs lately…but each time that we stand up or go near to the pond they go quiet and we can never find them! 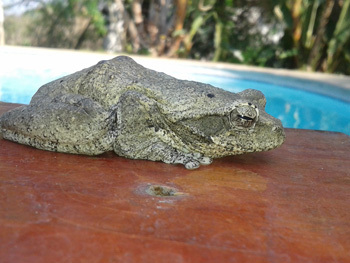 We know play a game with our guests to try and spot the frogs before they disappear! Earlier in the month I was sitting in the reception, doing my work as usual, when I heard an awful screeching! At first I thought it may have been a monkey, but the screeching was too high pitched. I made my way cautiously to the doorway and I saw a bird had just flown up with something in its mouth. When I took a closer look I saw that it was a frog. I was so shocked to see how this bird had been able to see this frog in the roof just above the reception door and how it managed to get this frog! Luckily it had not been a snake, as we first suspected. But I still spend most of my days checking above the reception door, just in case there is something wanting to visit me from the roof. We have decided to call our new 4 star lodge KATEKANI LODGE. The word KATEKANI in Tsonga (the language of the Shangaan people) means ‘Blessings’ and I thank Margrett of Marc’s Treehouse Lodge for her insights. Viva Safaris has had many blessings, not least of which have been the many Shangaan staff. I will include some pics of Katekani Lodge chalet in my November newsletter. This trip was by far the highlight of my year so far. Both tresmina and marcs treehouse camp were excellent value for money, the setting of the latter was perfect, the staff helpful, nothing was too much trouble, highlights of the trip were moholoholo animal rehab centre and tshukudu game reserve and of course kruger park. All of the guides were very helpful. A tip would be to believe people when they say wrap up warm for the game drives as no matter how hot it is in the day it can get cold on the back of the truck when the sun starts to go down. I cant thank you enough for an amazing week and although my trip to south africa was short I have done ans seen so much that I feel like I have been away for much longer. Special thanks to pretty and our guide for kruger luke. è stata una esperienza meravigliosa e irripetibile; meravigliosa e indimenticabile. (it has been a wonderful and unrepeatable experience; wonderful and unforgettable). A special thank to the guides ( Bongani, Rex, Lucke ), Michelle, Adelina ( the cook ) and all the staff that give us the assistance we needed. I’ll never forget your organisation and people it belongs. Sono soltanto dispiaciuto che non ho potuto conoscerti di persona ma ho saputo che tu vivi quasi sempre a Durban. I’m sorry about it! Anyway I’ve another question: non ho ricevuto la Newsletter di Settembre. All of you will be always in my heart!